Boundaries on the Balkans after the First and the Second Balkan War. The Balkan Wars were two wars in South-eastern Europe in 1912–1913, in the course of which the Balkan League (Kingdom of Bulgaria, Kingdom of Montenegro, Kingdom of Greece, and Kingdom of Serbia) first conquered Ottoman-held Macedonia, Albania, and most of Thrace in the First Balkan War and then fell out over the division of the spoils fighting the Second Balkan War. By the end of the war, however, the Ottoman Empire no longer ruled any European territory outside Turkey itself. Great Britain and France did not especially favor the unification of the Balkans under the League, seeing this as a threat to their own interests by creating an opportunity for Russia to dominate the region. Austria-Hungary favored the continuation of Ottoman power in the region, since her own imperial future could even be jeopardized by the collapse of a similar entity. Germany had formed an alliance with the Ottomans, so wished the empire no harm. A few years after the end of the Second Balkan War, in 1918, Slovenia, Croatia, Bosnia-Herzegovina, Mentenegro and Serbia united under the Kingdom of the Slovenes, Croats, and Serbs, later known as Yugoslavia. A Third Balkan War took place between 1991 and 2001, following the disintegration of Yugoslavia. This is generally discussed as a separate and distinct conflict, while the First and Second are discussed as inter-related. However, the causes of the Third Balkan War can not be understood without reference to the earlier conflicts. The anti-Ottoman struggle that led to Serbian independence in 1878, and the re-emergence of a Croatian state in 1868 awoke memories of earlier medieval entities, the Kingdom of Croatia (925-1102) and the Serbian Empire and kindled the desire to revive these in the contemporary context. This fueled conflict over borders, as Croatia claimed jurisdiction over wherever Croatians lived and Serbia claimed the same with reference to Serbs. Serbia and Croatia also chose to stress their European, Christian and mono-cultural heritages as opposed to some, especially in Bosnia, who saw their legacy as in terms of cross-cultural exchange and cooperation. The international community's slowness to respond to the Third Balkan War was explained at the time in terms of people in that part of the world habitually killing each other. Warren Christopher, giving testimony before the U.S. Congress on May 7, 1993, explained the violence in terms of "ancient antagonisms" (Sells, page 127). Lawrence Eagleburger, formerly of the same office of state in the U.S. declared, "they have been killing each other with a certain amount of glee in that part of the world for some time now" (Sells, page 124). Sells suggests that the choice of the term "in that part of the world" was a deliberate hint to the domestic U.S. audience that "these people are not our concern." Both Sells and Glenny refer to the tendency of outsiders to see an "imagined Balkans—a world where people are motivated not by rational considerations but by a mysterious congenital bloodthirstiness" (Glenny. 2000. page 661.; Sells. 1998. pages 125-128). Too often, the powers have intervened or failed to intervene based on the promotion of their own interests. If those with the ability to prevent war, or to help to create just and peaceful societies, fail to attach equal value to the welfare of all people, some will continue to prosper and others will perish. The background to the wars lies in the incomplete emergence of nation-states on the fringes of the Ottoman Empire during the nineteenth century. Serbians had gained substantial territory during the Russo-Turkish War, 1877–1878, while Greece (independent since 1829) acquired Thessaly in 1881 (although it lost a small area to the Ottoman Empire in 1897) and Bulgaria (an autonomous principality since 1878) incorporated the formerly distinct province of Eastern Rumelia (1885). All three, as well as Montenegro, sought additional territories within the large Ottoman-ruled region known as Roumelia, comprising Eastern Roumelia, Albania, Macedonia, and Thrace. Throughout the nineteenth century, the Great Powers had different aims over the "Eastern Question," the integrity of the Ottoman Empire. Russia wished for access to the "warm waters" of the Mediterranean and followed a pan-Slavic foreign policy, supporting Bulgaria and Serbia. Britain wished to deny Russia access to the "warm waters" and supported the integrity of the Ottoman Empire, though it also supported a limited expansion of Greece as a backup plan in case integrity of the empire was no longer possible. France wished to strengthen her position in the region, especially in the Levant. Austria-Hungary wished for a continuation of the existence of the Ottoman Empire, since both were multinational entities ruled by a small elite and thus the collapse of the one would affect the other as well. Also, in the eyes of the Habsburg (or Hapsburg) empire, with its large Serbian and Croatian populations, the strengthening of Serbia was highly undesirable. While it has been argued that Italy from that time already wished to recreate the Roman empire, her main aim at the time seems to have been primarily the denial of access to the Adriatic Sea of another major sea power. Germany in turn, under the "Drang nach Osten" policy, aspired to turn the empire into its own de-facto colony, and thus supported its integrity. The Balkan countries themselves (except Serbia) sent armed bands inside the Empire (in Macedonia and Thrace) in the late nineteenth and early twentieth centuries, to protect their own nationals and terrorize those of other nationalities. Low intensity warfare had broken out inside Macedonia between Greek and Bulgarian bands and the Ottoman army after 1904, the so-called Macedonian Struggle. After the Young Turk Revolution of July 1908, the situation changed somewhat drastically. It is no surprise that the "Young Turk" revolution occurred in the troubled European provinces of the Empire. There the threat to its integrity was the most pronounced, and the need for reforms was most evident. When the revolt broke out, it was supported by intellectuals, the army, and almost all the ethnic minorities of the Empire, and forced Sultan Abdul Hamid II to re-adopt the long defunct Ottoman constitution of 1877, ushering the so-called Second Constitutional Era. Hopes were raised among the Balkan ethnicities of reforms and autonomy, and elections were held to form a representative, multi-ethnic, Ottoman parliament. However, following the Sultan's attempted counter-coup, the liberal element of the Young Turks was sidelined and the nationalist element became dominant. At the same time, in October 1908, Austria-Hungary seized the opportunity of the Ottoman political upheaval to annex the de jure Ottoman province of Bosnia-Herzegovina, which it had occupied since 1878 (see Bosnian Crisis), and Bulgaria declared itself a fully independent kingdom. The Greeks of the autonomous Cretan state proclaimed unification with Greece, though the opposition of the Great Powers prevented the latter action from taking practical effect. Distribution of ethnic groups in the Balkan Peninsula and Asia Minor in 1923, Historical Atlas by William R. Shepherd, New York (The map does not reflect the results of the 1923 population transfer between Greece and Turkey). Frustrated in the north by Austria-Hungary's incorporation of Bosnia with its 975,000 Orthodox Serbs (and many more Serbs and Serb-sympathizers of other faiths), and forced (March 1909) to accept the annexation and restrain anti-Habsburg agitation among Serbian nationalist groups, the Serbian government looked to formerly Serb territories in the south, notably "Old Serbia" (the Sanjak of Novi Pazar and the province of Kosovo) where few Serbs live but which is regarded as the spiritual capital of Serbia. On August 15, 1909, the Military League a group of Greek officers took action against the government to reform their country's national government and reorganize the army. The league found itself unable to create a new political system, till the league summoned the Cretan politician Eleutherios Venizelos to Athens as its political adviser. Venizelos persuaded the king to revise the constitution and asked the league to disband in favor of a National Assembly. In March 1910, the Military League dissolved itself. 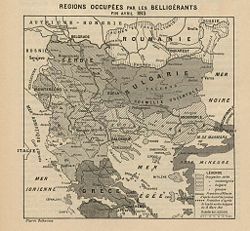 Bulgaria, which had secured Ottoman recognition of her independence in April 1909, and enjoyed the friendship of Russia, also looked to districts of Ottoman Thrace and Macedonia. In March 1910, an Albanian insurrection broke out in Kosovo which was covertly supported by the young Turks. In August 1910, Montenegro followed Bulgaria's precedent by becoming a kingdom. With the initial encouragement of Russian agents, a series of agreements was concluded between Serbia and Bulgaria in March 1912. Military victory against the Ottoman empire would not be possible while it could bring reinforcements from Asia. The condition of the Ottoman railways of the time was primitive, so most reinforcement would have to come by sea through the Aegean. Greece was the only Balkan country with a navy powerful enough to deny use of the Aegean to the Turks; thus a treaty was signed between Greece and Bulgaria in May 1912. Montenegro concluded agreements between Serbia and Bulgaria later that year. Serbia and Bulgaria signed treaties to divide between them the territory of northern Macedonia, but no such concrete agreement was signed by Greece. No formal plan existed between the Balkan allies on how to wage the war, except for some cooperation between Serbia and Montenegro over Novi Pazar. The war was practically four different wars fought against the same enemy, at the same time, and in the same region. The Ottoman plans called for the use of an army from Syria to be transferred in the Balkans as part of the defense. Due to Greek maritime operations, this proved impossible. The Turks raised their normal forces and in order to make up for the shortfall they raised the Army of Axios, which proved to be of low quality. Before the ultimatum, Montenegro first declared war on October 5. The main thrust was towards Shkodra, with secondary operations in the Novi Pazar area. 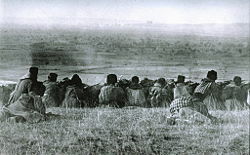 Bulgaria attacked towards Eastern Thrace, being stopped only at the outskirts of Constantinople in the Chataldja line. Serbia attacked south towards Skopje and Monastir. Meeting the Greek army later, they turned west towards the Adriatic. Greece landed forces in the Halkidiki peninsula while the main force of the army attacked from Thessaly into Macedonian through the Sarantaporo straight. After the liberation of Thessaloniki (on October 26, 1912, O.S.) the Greek army linked up with the Serb army north and they turned west. Another Greek army had attacked into Epirus, and forces were deployed to that front. Meanwhile the Greek navy rapidly occupied the Aegean islands still under Ottoman rule. Following the declaration of war, the Ottoman Navy did not dare exit the safety of the Dardanelles and spent most of its time in Nagaras. The Greek Navy was free to liberate the islands of the Aegean, starting with Lemnos, which was used as a base to monitor the Dardanelles. Following a ceasefire in December between the Ottoman Empire and Bulgaria, Serbia and Montenegro, the Turkish fleet twice exited the Dardanelles but was twice defeated in the battles of Elli and Lemnos. In January, after a coup, Turkey decided to continue the war. Bulgarian forces managed to conquer Adrianople, while Greek forces liberated Ioannina. The war was ended with the Treaty of London on May 17, 1913. Though the Balkan allies had fought together against the common enemy, that was not enough to overcome their mutual rivalries. The Second Balkan War began when Serbia, Greece, and Romania quarreled with Bulgaria over the division of their joint conquests in Macedonia. When the Greek army entered Thessaloniki in the First Balkan War ahead of the Bulgarian 7th division by only a day, they were asked to allow a Bulgarian battalion to enter the city. Greece accepted in exchange for allowing a Greek unit to enter the city of Serres. The Bulgarian unit that entered Thessaloniki turned out to be a brigade instead of a battalion and caused concern among the Greeks, who viewed it as an attempt to establish a condominium over the city. It was removed (along with the Greek unit from Serres) by mutual treaty and was transported to Dedeağaç (modern Alexandroupolis), leaving only a small force behind. Greece had also allowed the Bulgarians to control the stretch of the Thessaloniki-Constantinople railroad that lay in Greek-occupied territory, since Bulgaria controlled the largest part of this railroad anyway. Bulgaria however was not satisfied with the territory it controlled in Macedonia and asked Greece to relinquish control of land west of Thessaloniki, in Pieria. At the time, Thessaloniki was a major and strategic port in the surrounding area. This Bulgarian request alarmed Greece, which decided to maintain a high level of alert on its army. Furthermore tension between Serbia and Bulgaria was rising. Distribution of ethnic groups in the Balkan Peninsula and Asia Minor in 1922, Racial Map Of Europe by Hammond & Co.
After a series of negotiations Greece and Serbia signed a treaty of mutual defense against an attack on any part, not only Bulgarian but also Austro-Hungarian on May 19/June 1, 1913. With this treaty a mutual border was agreed between the two and an agreement for mutual diplomatic support. Both countries decided to remain on the defensive and not attack Bulgaria. Still, the Serbians kept the entire Vardar Macedonia. The Serbians did not recognize the border treaty they signed. On June 16, 1913, Tsar Ferdinand I of Bulgaria and General Savov, without consulting the Bulgarian government declared war on Greece and Serbia. On June 17, 1913, they attacked the Serbian army in Gevgelija and then the Greek army in Nigrita. While the Serbian army faced superior Bulgarian forces and had problems, the Greek army was more successful. Retreating according to plan for two days while Thessaloniki was cleared of remaining Bulgarian detachments, the Greek army counterattacked and defeated the Bulgarians at Kilkis-Lahanas. However, the Greek army did not enter the city of Serres in time to prevent it being razed by irregular Bulgarian units. The Greek army then divided their forces and advanced in two directions. Part proceeded east and occupied all land west of the Mesta River. The rest of the Greek army advanced up the Struma River valley, defeating the Bulgarian army in the battles of Doiran and Mt. Beles before themselves being defeated at the Kresna straits and facing total annihilation. The Greeks offered a ceasefire and the Bulgarians accepted due to the danger posed by the Romanian army in the north. Seeing the military position of the Bulgarian army, Romania and the Ottoman Empire decided to intervene. Romania raised an army and declared war on Bulgaria on June 27. They encountered little resistance from the Bulgarians, and by the time of the ceasefire were only 30 kilometers from Sofia. The Ottomans managed to retake Adrianople (Edirne) which had historic significance for the Turks, being a former Ottoman capital city (see Adrianople). The Ottomans also managed to recover eastern Thrace, which had largely been lost in the First Balkan War, and thus regained a land mass in Europe which was only slightly larger than the present-day European territory of the Republic of Turkey. The wars were an important precursor to World War I, to the extent that Austria-Hungary took alarm at the great increase in Serbia's territory and regional status. This concern was shared by Germany, which saw Serbia as a satellite of Russia. Serbia's rise in power thus contributed to the two Central Powers' willingness to risk war following the assassination in Sarajevo of the Archduke Francis Ferdinand of Austria in June 1914. After World War I, Serbia took the lead in forming, with her own king as its monarch, the Kingdom of the Slovenes, Croats, and Serbs, which became Yugoslavia. It was Serbia's desire to continue to dominate the region after the collapse of Yugoslavia that sparked the Third Bosnian War; Serbia opposed the independence of former Yugoslavian republics as each broke away to form sovereign nations. Bosnia-Herzegovina's Muslim population became the target of what was called "ethnic cleansing" as some Serbs and some Croatians tried to deny that a multi-culturally harmonious society had ever existed there, claiming that Bosnia was part of their revived medieval entities. Serbia's attempt to remove the majority of non-Serbs (Albanians) from Kosovo was also a major factor in fueling conflict. Gallagher argues, however, that the problems of the region have as much to do with the way in which external powers have intervened or failed to intervene, depending on their interests. During the First and Second Balkan Wars, the great powers had different agendas; Russia had imperial designs, Austria-Hungary and Germany favored the Ottomans while Britain saw the region more as a buttress against the Ottomans than as a venue in which modern nation states could emerge. Even after the area was technically within the Soviet sphere of influence during the Cold War, the Soviets were never as interested in the Balkans as they were in East Germany or in Poland. Western Europeans missed an opportunity to nurture democracy in the region, which they might have attempted even before the collapse of Yugoslavia. Some suggest that the "othering" of the Balkans as somehow not really European has made intervention either predatory or patronizing or both. Instead of placing the interests of the Balkan people at the center, the powers have put their own concerns at the center and historically have used the region as a playground for their own rivalries. The Balkans, he says, has been seen "as a permanently disturbed region on the margins of Europe. ↑ Encyclopedia Britannica Online, Military League. Retrieved August 4, 2008. ↑ U.S. Library of Congress, The Balkan Wars, Country Studies. Retrieved August 4, 2008. ↑ 3.0 3.1 Encyclopedia Britannica, Balkan Wars: European History. Retrieved August 4, 2008. ↑ Encyclopedia Britannica, History of Greece: Byzantine to Modern. Retrieved August 4, 2008. ↑ George Phillipov, The Macedonian enigma, Australia & World Affairs. Retrieved August 4, 2008. Allcock, John B. 2000. Explaining Yugoslavia. New York: Columbia University Press. ISBN 9780231120548. Gallagher, Tom. 2001. Outcast Europe: the Balkans, 1789-1989, from the Ottomans to Milošević. London: Routledge. ISBN 9780415270892. Glenny, Misha. 2000. The Balkans: Nationalism, War, and the Great Powers, 1804-1999. New York: Viking. ISBN 9780670853380. Jelavich, Charles, and Barbara Jelavich. 1977. The establishment of the Balkan national states, 1804-1920. Seattle: University of Washington Press. ISBN 9780295954448. Kaplan, Robert. 2005. Balkan Ghosts: A Journey Through History. New York: Picador. ISBN 9780312424930. Vŭchkov, Aleksandŭr. 2005. The Balkan War 1912-1913. Sofia, BG: Angela. ISBN 9789549058741. 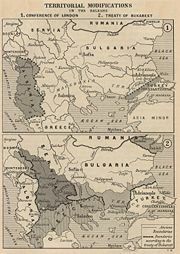 Project Gutenberg's The Balkan Wars: 1912-1913, by Jacob Gould Schurman. US Library of Congress on the Balkan Wars. This page was last modified on 10 May 2016, at 16:29.